Jason wrote to me this morning asking for some clarification on a series of questions. I am not sure if others have these questions too, so I thought I would share both his questions and my answers. I took a stab at clarifying. Sunshine on my tiny house makes me happy. 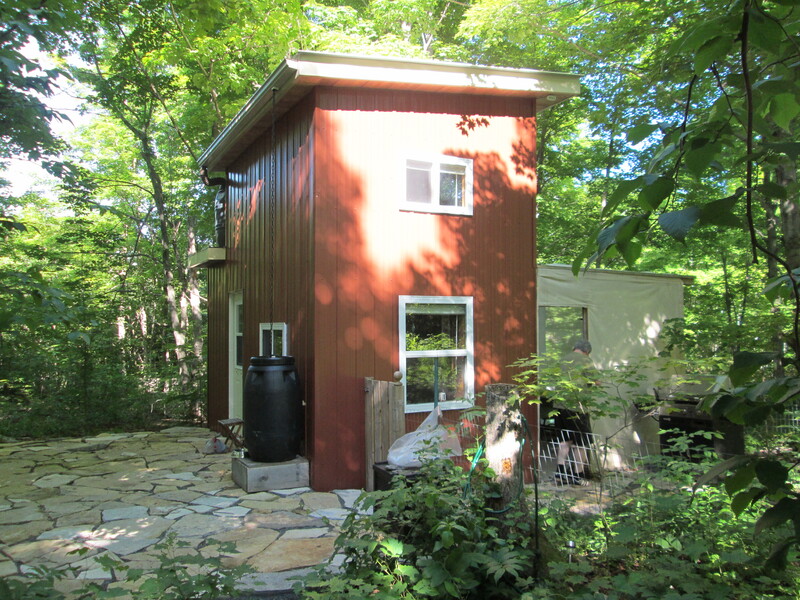 If you hook a tiny house up to a septic system or to city infrastructure, it is still a tiny house, but one with modern conveniences. Do you think that my answers are correct? Do you know of a Canadian, or better yet Ontario/Quebec company that makes, or can make flatbed trailers that are well suited to tiny homes? I know some of the ones in the US, but I would prefer to shop local, and I also do not like the hassle of customs/duty/importing. You know, this is easy! Any company who makes custom trailers can make one for a tiny house. Google your area for your closest custom company and go see them. If you like them and think they will work with you then this is the company for you. For your part, you need to know what your needs are. Specifically, tiny house trailers need to be suited to the weight that you are planning on putting on them. The absolutely best situation is to extend out to the sides (where the building goes out around the wheels) because these sides will hold the weight of your build. Another thing to be sure of is to know where your plumbing is going so that if you choose to put in a toilet with a holding tank under the trailer or likewise a grey water tank that the steel structure of the trailer will not conflict with any of your drains. As for the WEIGHT… you will have to decide what class of licence you will need to tow it and adjust your trailer size, building size and materials accordingly. This is so that you can stay under the A class licence or need for a huge and heavy vehicle, if you wish. With very kind regards, best of luck and PLEASE keep in touch or ask any questions that you need to. I am mostly able to get back to messages here within 24 hours. Excepting early December when I will go for surgery. Also… a little extra thing that I have noticed being done on a couple of tiny houses and for sure what I would do with my wooden deck that is attached to the trailer is to line the part that touches the steel trailer bed with thin plywood and then with the flat steel flashing so that there is a layer of protection against rodents and or wood rot. I would also go ridged or spray for the floor because then you don’t have to worry about any water that drips into your floor while you are building. Looking great…!! The flagstones look so nice.